Discover what makes you awesome, and how to articulate that in a compelling, unique and authentic way. 1. Are you part of the consideration set? 2. What are they saying about you? 3. Do you want to change it? 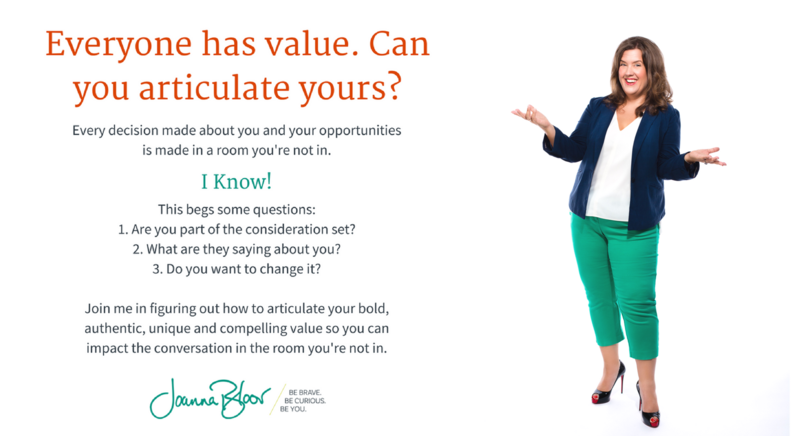 Join Joanna in learning how to articulate your bold, authentic, unique and compelling value so you can impact the conversation in the room you're not in. Discover how to talk about yourself in a compelling, clear, and concise way. Tips for turning your individual skill set into something highly sought after. Specialized tools that will help you gain a deep understanding of how to effectively uncover your strengths. Anyone seeking to advance their careers. Anyone who wants to articulate their personal skill-set in a unique and compelling manner. Individuals who are looking to identify their individual strengths and create opportunities for themselves. Want a little sneak peek into the course?! Start the free trial and download the bonus worksheet,"Identifying What You're Great At Worksheet" to get started.